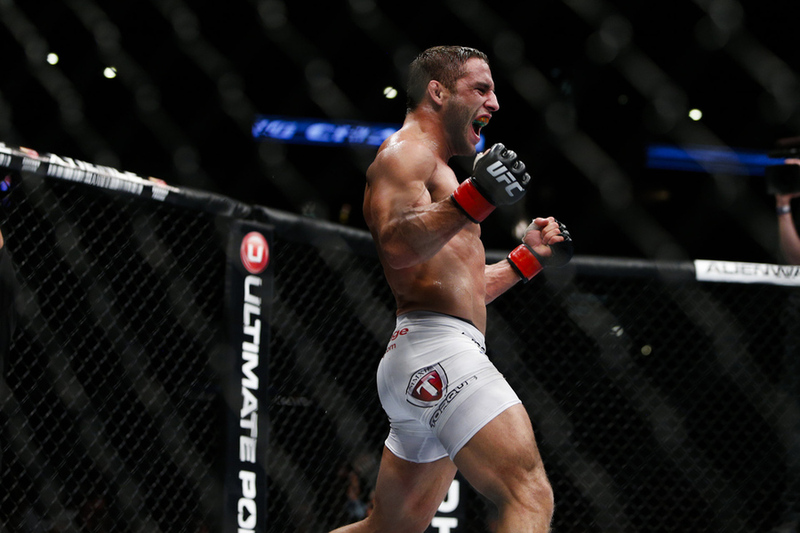 UFC 179: Aldo vs. Mendes 2 - Buy It or 'Bar' It? 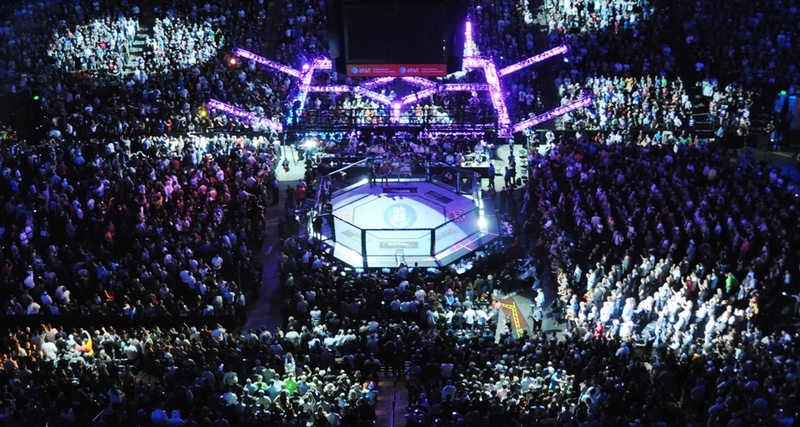 Some MMA fans have no reservations about spending $55 for every UFC pay-per-view event. For these fans, the ability to watch a night of fights in the comfort of their homes is worth the extra line-item in their monthly budget. Others, however, prefer to spend that money on food and drink at the local Spicy Crazy Wings while the promotion’s premium cards are displayed across the restaurant’s many large-screen televisions. These fans not only get to direct their hard-earned dollars in a more tangible way (i.e. beer), but also get to share the experience of a UFC event with other interested fans of MMA. Judging by the sometimes wild fluctuations in the UFC’s pay-per-view buyrates, it appears that most MMA fans fall somewhere in the middle. They’ll spring for a handful of UFC pay-per-view cards on their own, perhaps inviting a few friends over to help defray the expense, but will also spend their money elsewhere if a particular event is not especially compelling. If you count yourself among this group who determines their UFC viewing venue on a card-by-card basis, Combat Press has you covered. Before each of the UFC’s pay-per-view events, we’ll review the main-card fights and surrounding circumstances before determining whether you should buy it or “bar” it. This week, we’ll tackle UFC 179, taking place Oct. 25 from Ginásio do Maracanãzinho in Rio de Janeiro, Brazil. With the extreme differences between some of the UFC’s recent pay-per-view offerings (UFC 177 being an on-paper dud; UFC 178 being absolutely loaded), it’s nice to actually be able to mull this decision over for a few minutes. Saturday’s event offers the most interesting rematch since Chris Weidman/Anderson Silva II in its titular title tilt between featherweight champion Jose Aldo and consensus top contender Chad Mendes. It also features a clash between two members of the light heavyweight top 10, an interest-piquing featherweight contest that’s almost too close to call and a showdown between two rising lightweight stars. There’s also the Fabio Maldonado/Hans Stringer fight, but we’ll get to that later. Unlike UFC 178, the main-event bout at UFC 179 is actually the most appealing on the pay-per-view portion of the card. Though we’ve seen the match-up before, the outcome is far from certain this time around. Aldo has not lost since 2006 and has held the WEC/UFC featherweight title for nearly five years. No one has come close to taking his belt in that entire time and his efforts have earned him the top spot in the Combat Press pound-for-pound rankings. Mendes is no slouch, though. He’s lost precisely one time in his professional career, and that was to Aldo in January 2012. Since that time, he’s rattled off a string of performances that have made him one of the UFC’s most impressive competitors in recent years. Before fighting Aldo for the first time, Mendes won four straight fights by decision. After his loss to the featherweight champion, Mendes proceeded to finish his next four opponents with strikes, opening the MMA world’s eyes to a new, very dangerous weapon in his arsenal. It’s this recent striking success that has many fans hesitating to so quickly call the UFC 179 main event for Aldo. While the champion has certainly shown himself to be an adept striker in his own right, he has yet to face anyone in the UFC with the sort of explosiveness in his fists that Mendes possesses. All it would take is for the lightning-quick Mendes to close the distance one time and land a solid blow and it could spell the end for Aldo like it has for so many of Mendes’s recent opponents. This focus on the challenger’s striking abilities completely ignores Mendes’s wrestling base, which he could also use to make this fight a little more of a grind, though Aldo does possess a black belt in jiu-jitsu. Needless to say, this featherweight title fight is correctly positioned at the top of the UFC 179 pay-per-view card, not only due to the stakes, but also the fact Aldo’s grasp on his belt has never been more tenuous. Add in Aldo’s recent injury, and the result is even more in question. Should be a good one. The UFC 179 co-main event offers two of the company’s best light heavyweights the opportunity to remain in the 205-pound title picture, with the winner likely just another victory or two away from a championship opportunity. For Phil Davis, the fight on Saturday represents his latest (and perhaps last) chance to assert himself as a true contender at light heavyweight. He started out his UFC career by winning five straight, but then lost to Rashad Evans in a 2012 title eliminator. Davis would recover with a few more wins, including one over former 205-pound champion Lyoto Machida, before again being stopped at the gates to Contenderville by Anthony Johnson in his most recent fight. 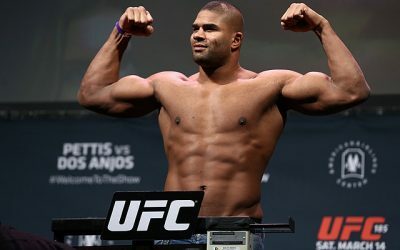 A win over Glover Teixeira would certainly place him in the light heavyweight top five and, if the cards fall correctly, could land him with a title shot sooner rather than later, given champion Jon Jones’s previous success over other members of the 205-pound elite. For Teixeira, the showdown with Davis at UFC 179 represents his best chance to remain relevant in the Octagon. Yes, we saw him pretty easily dispatch his opposition pre-Jon Jones, but Jones had almost no problems against the Brazilian when the two met in April. 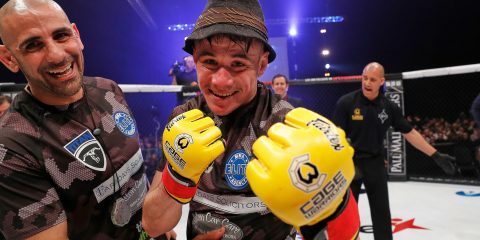 Could Teixeira fight his way back into title contention? 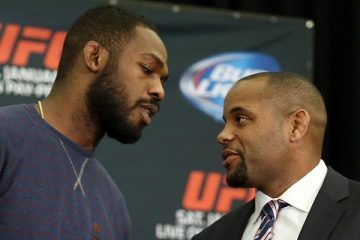 Absolutely, but given the recency of his loss to Jones, it will take more than a victory over Davis to do the trick. He’ll not only need to beat Davis, he’ll need to beat Davis up. 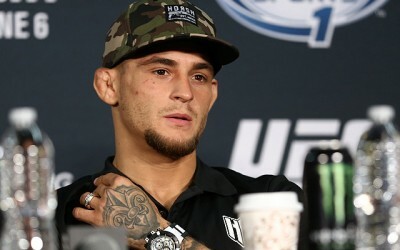 After that, he probably needs at least one more quality UFC win to even be considered for another title shot since he came up short the first time around. This fight, while perhaps not immediately impactful in the light heavyweight title scene, should give fans an indication of which of the two competitors still has the drive to succeed on a championship level, and which might instead be relegated to gatekeeper status. Less attentive fans might look at the featherweight contest between Darren Elkins and Lucas Martins and wonder why it was even put together in the first place. 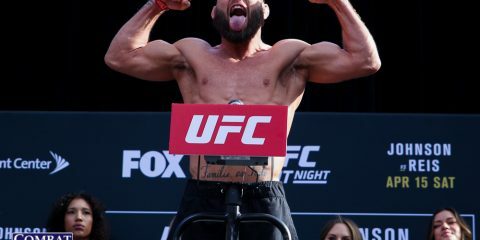 After all, Elkins is ranked 13th among the UFC’s 145-pounders while the unranked Martins has been on the main card of a UFC event precisely once before. Looking a little closer, though, this fight becomes perhaps the most difficult to predict of the five airing on pay-per-view. Elkins has been hovering near the top of the featherweight division for quite some time, and even fought his way to a match-up with top contender Mendes. Unfortunately, Elkins would end up being one of Mendes’s four aforementioned KO/TKO victims, thus putting an abrupt halt to his momentum. He’d recover by winning a decision over Hatsu Hioki before dropping his most recent fight to Jeremy Stephens in another 15-minute affair. 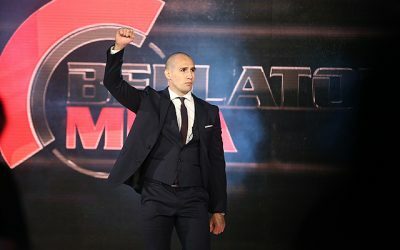 Martins, meanwhile, has preferred to keep his interaction with the judges to a minimum, having only fought to decision one time in 16 pro fights. 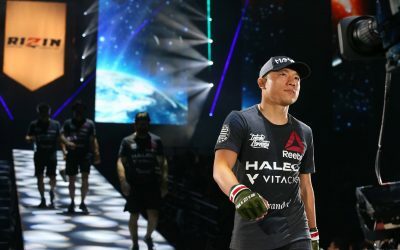 He lost his UFC debut to Edson Barboza—the only loss on his ledger—but came back with three straight stoppage victories to establish himself as someone to watch at 145. Surely, Martins’s penchant for excitement has just as much to do with his place on the UFC 179 main card as his winning streak, and he’s going to give Elkins all he can handle. And then, right in the middle of everything, is a light heavyweight contest between 15th-ranked Fabio Maldonado and a 22-5-3 Dutchman named Hans Stringer. Of the five fights on the pay-per-view portion of UFC 179, this one is the ugly duckling. 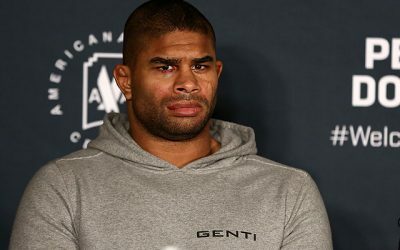 Maldonado has toiled around the middle rankings of the light heavyweight division, but is just 4-4 in the UFC, with none of the wins coming against anyone who could be considered a contender. Perhaps Maldonado is being rewarded for his willingness to step up on short notice and fight top-five heavyweight Stipe Miocic in May. The fight lasted all of 35 seconds, and not in a good way for Maldonado, but the UFC admires when fighters do ill-advised things like moving up a weight class to battle one of its best fighters on short notice for the good of a card, so in return Maldonado gets the pay-per-view appearance (and hopefully a commensurate payday). 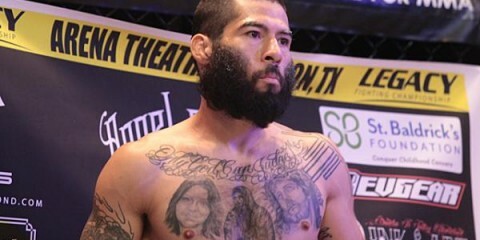 Riding Maldonado’s pay-per-view gravy train is Stringer, who debuted in the UFC back in March, notching a split decision victory over Francimar Borroso. Stringer is undefeated in his last seven fights and has won 17 times by stoppage. Maldonado is a brawler, so the best fans can hope for here is a light heavyweight firefight, or perhaps a performance by Stringer that garners him enough attention for a Wikipedia page. Obviously, the featherweight title fight is worthy of its spot atop the pay-per-view card, and Teixeira and Davis are both ranked highly enough to earn fans’ money to watch them fight as well. The co-main event would almost certainly headline a Fox Sports 1 card, and for that reason alone is correctly placed on Saturday’s main card. 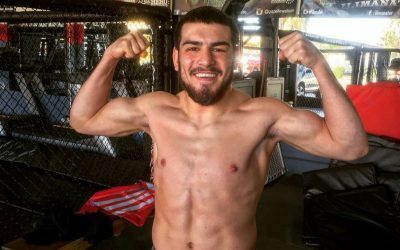 Elkins/Martins and Ferreira/Dariush would easily be main-card fights for a Fox Sports 1 event, and wouldn’t be the worst fights to open a card on Fox itself. 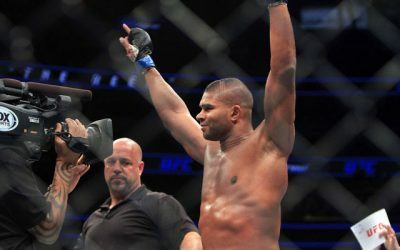 While more dedicated fans understand the potential in these fights, neither can really be used to sell the pay-per-view portion to casual fans (though the UFC did a great job with the Ferreira/Dariush segments of its Countdown to UFC 179 program); that is, the fans who make the difference between a so-so buyrate and a great buyrate. The Maldonado/Stringer fight is the tipping point for me, though. Yes, Maldonado’s name does appear on the official UFC rankings and technically he’s on a three-fight winning streak at light heavyweight. That said, if the UFC was interested in building his reputation, he’d have been given a more recognizable opponent than Stringer. While UFC 179, like many of the company’s “premium” events, certainly pales in comparison to the outstanding card brought to us last month, it at least offers a bit more intrigue than the heavily criticized pay-per-view event from August. Still, when comparing UFC 179 to some of the other big-time events on the horizon, this Saturday’s card leaves a bit to be desired. If you’ve got nothing else happening on Saturday night, then you could probably do worse than ordering this on pay-per-view. Otherwise, take a drive to your nearest UFC-friendly establishment and instead purchase a responsible number of beers.